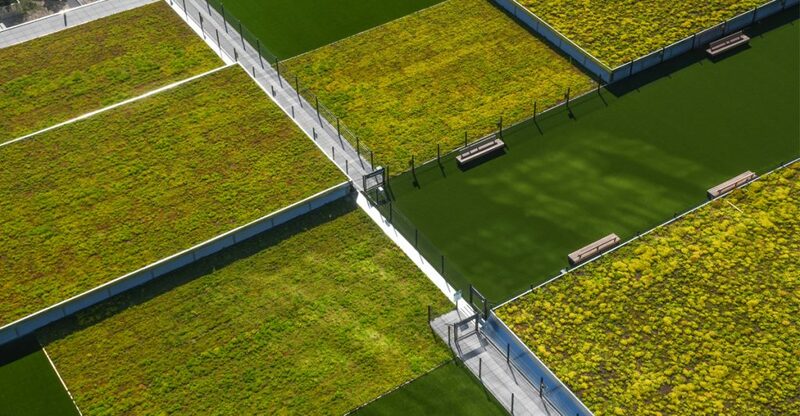 what was once a specialty niche greenroofs are now becoming a recognized landscape practice. 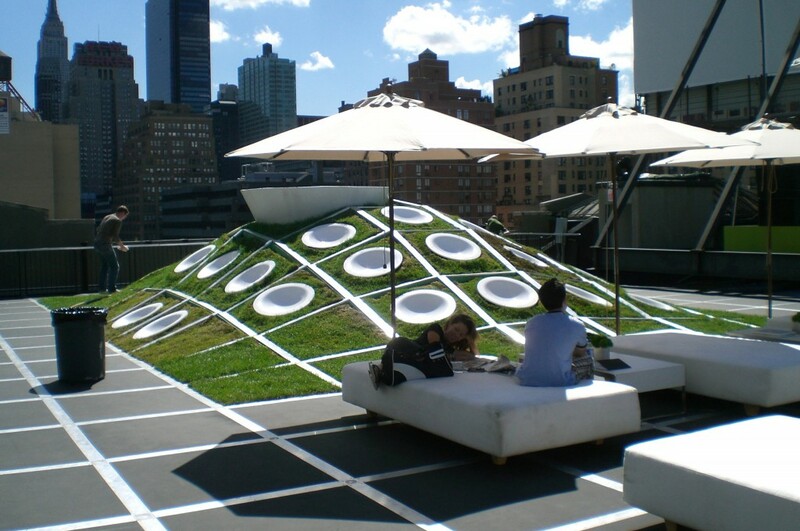 The popularity of green roofs has sharply increased over the last decade. 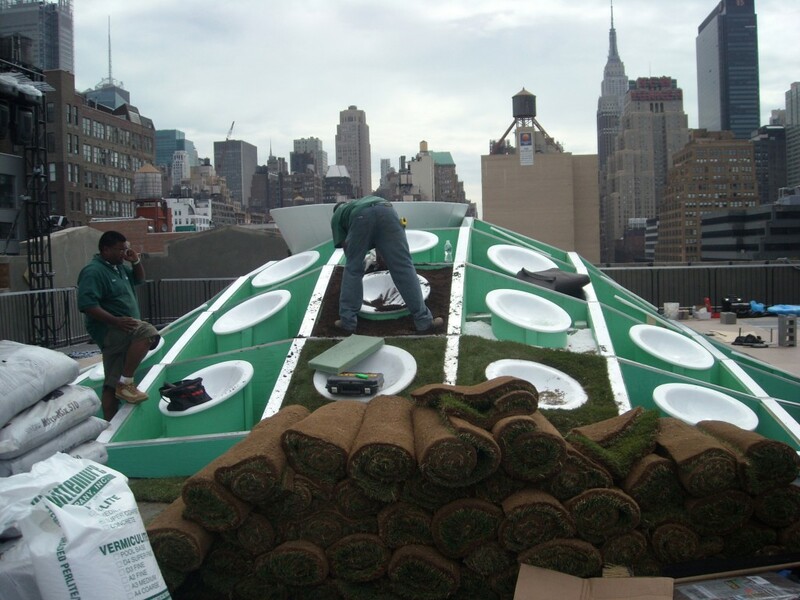 The importance of working with a contractor that knows and understands Green Roof systems cannot be underestimated. 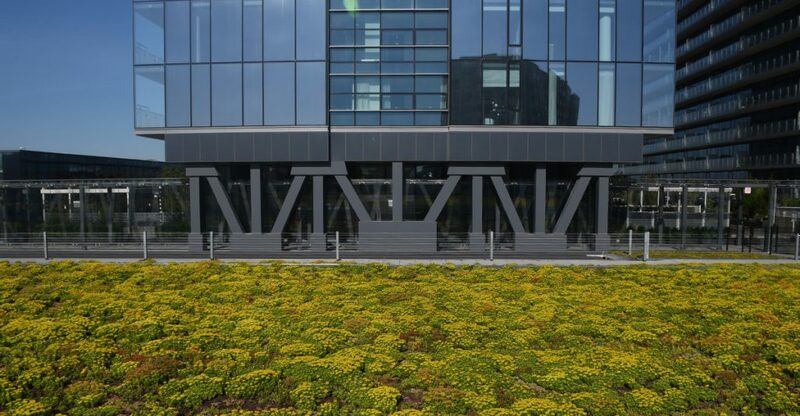 Blondie’s has years of experience working with various Green Roof systems and maintains close relationships with the industry’s top manufacturers. Our staff has undergone comprehensive training in order to correctly specify, install and maintain both intensive and extensive systems. 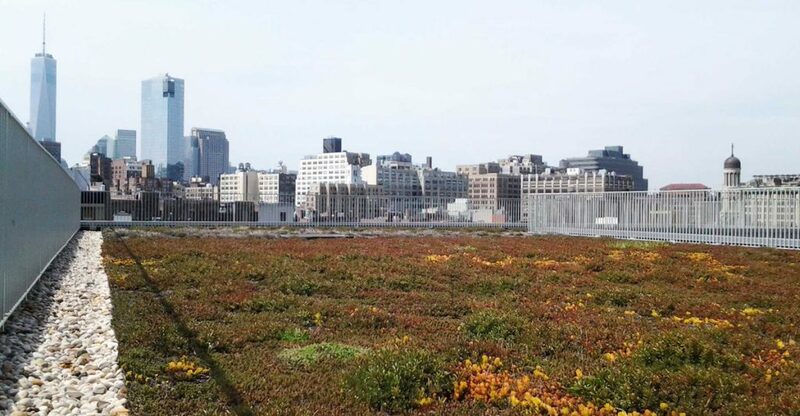 Properly servicing a Green Roof is a very specific skillset. 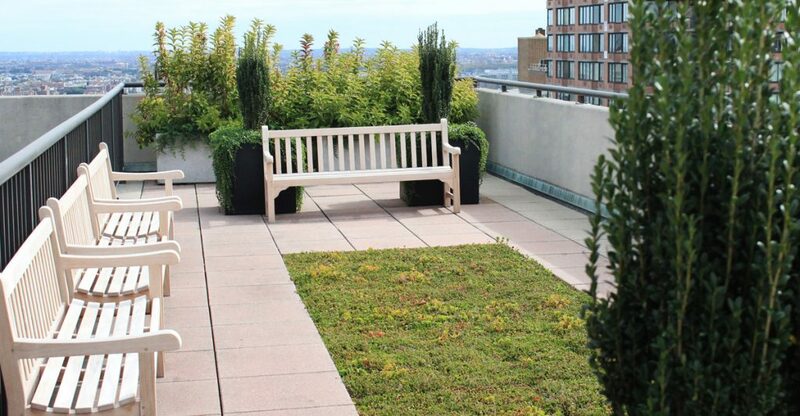 Blondie’s Green Roof Team has been educated in the installation and maintenance of various Green Roof systems. Beyond the obvious aesthetic improvement, the benefits of incorporating a Green Roof into a building include; Waste Diversion through decreased use of heating, ventilation and HVAC systems, Stormwater Management by retaining rain water and decreasing run-off, Improved air Quality by capturing airborne pollutants and filtering gases as well as providing new amenity spaces and increase in a building’s marketability. 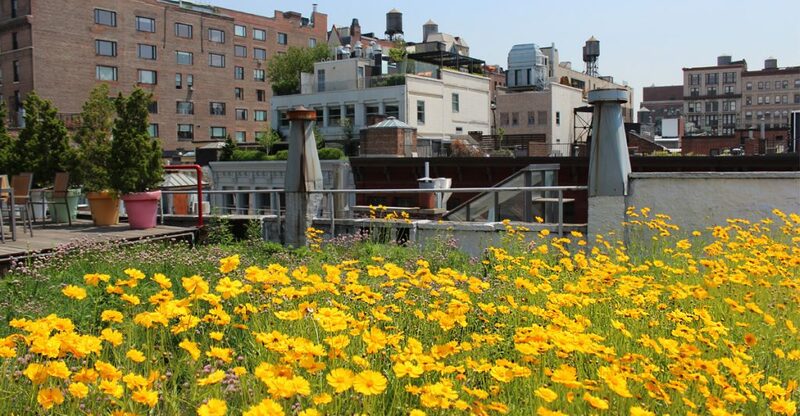 Rooftops that were once thought of as utilitarian are now being reclaimed as shared public space. Granting access to the outdoors offers a valuable amenity and improves the quality of life. 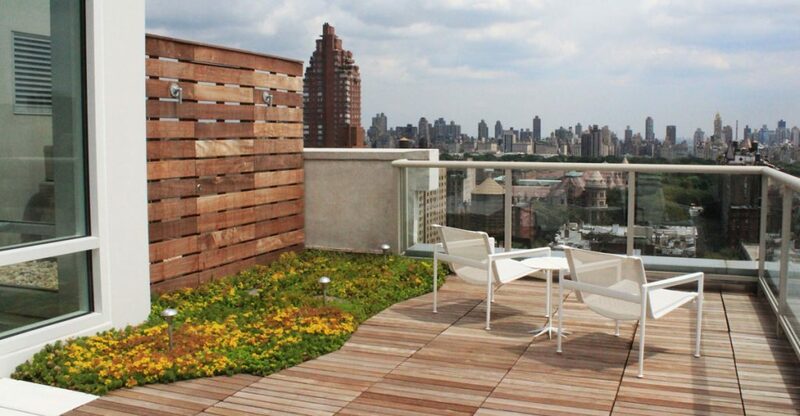 There are many Green Roof products on the market. Selecting a system that coincides with your site conditions and synchronize with your design and usage expectations will maximize your benefits. Blondie’s team will walk you through the various considerations in system selection and provide you with a comprehensive understanding. 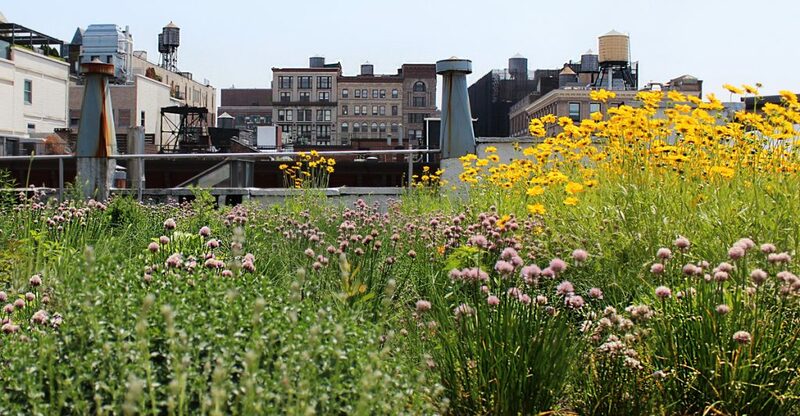 Plants incorporated into a green roof are a precise selection. Based on the type of system chosen for the site, Blondie’s team will grow or select the healthiest sustainable plants for the project. 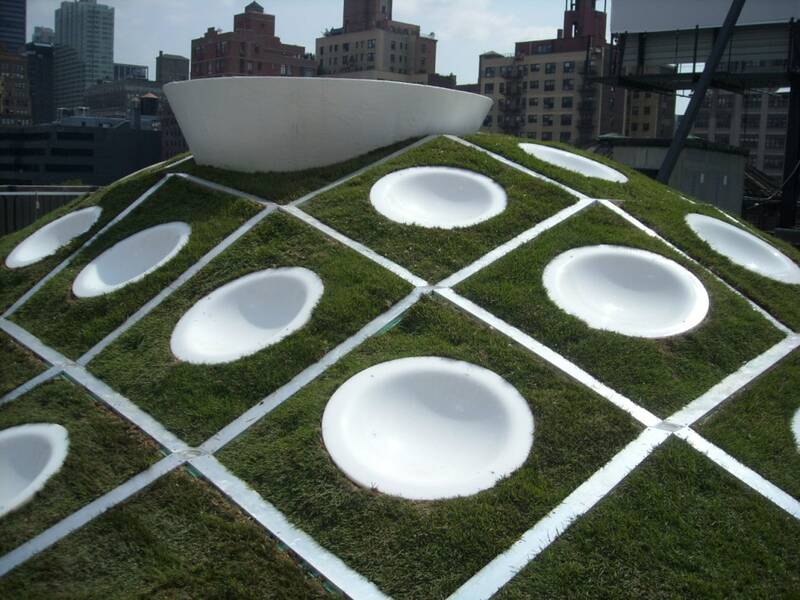 The installation of a Green Roof system must be closely managed. Every Green Roof system must be systematically installed with each layer needing proper installment before moving to the next. Blondie’s understands how to install, monitor and inspect the installation of this multiple layer process. Managing the project also means coordinating with everyone involved and keeping an accurate schedule. We will do all this while providing updates and maintaining clear and open communication. 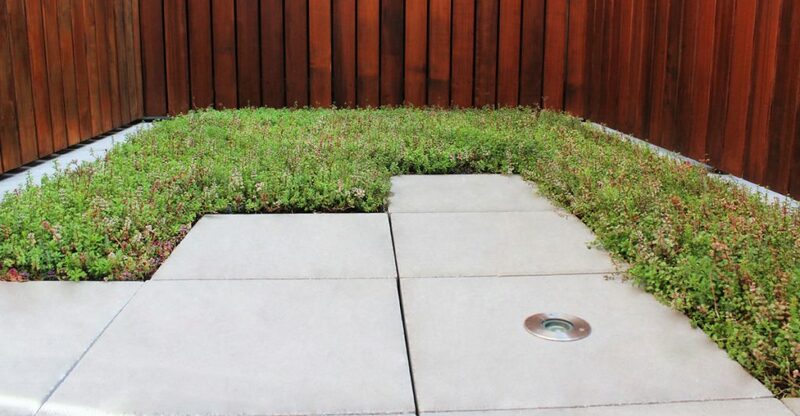 Once a green roof has been properly installed, it is closely monitored until it is well established. This is a very important step in the process as we are insuring a healthy foundation for the garden. Supplemental watering and fertilizing are generally required, as well as occasional weeding to prevent invasive plants from taking root and optimizing the growth of selected plant material. 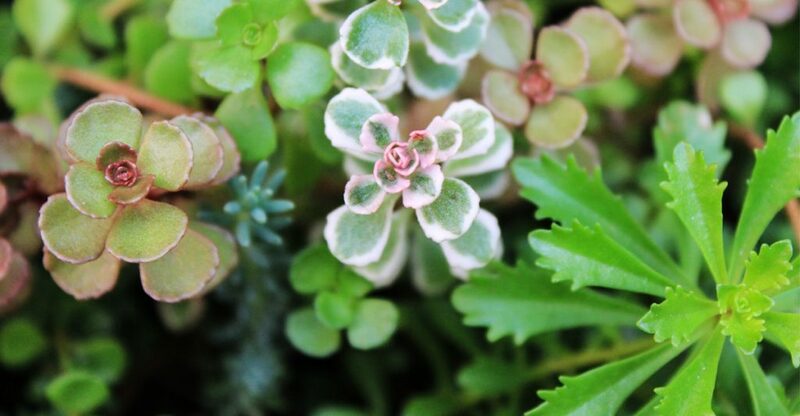 Ongoing maintenance for all green roofs is mandatory to keep everything looking its best. 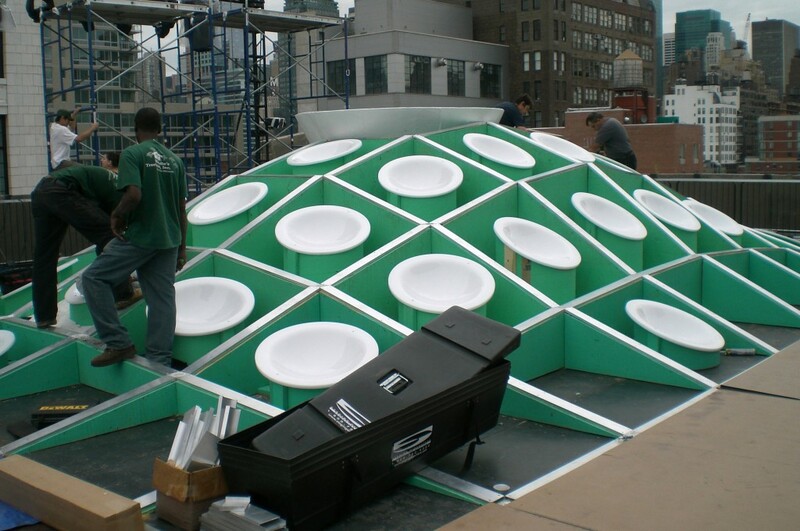 A service program unique to your site will be created and includes inspection of the roof membrane, analysis and maintenance of the irrigation and drainage paths as well as supervision of all plant material. 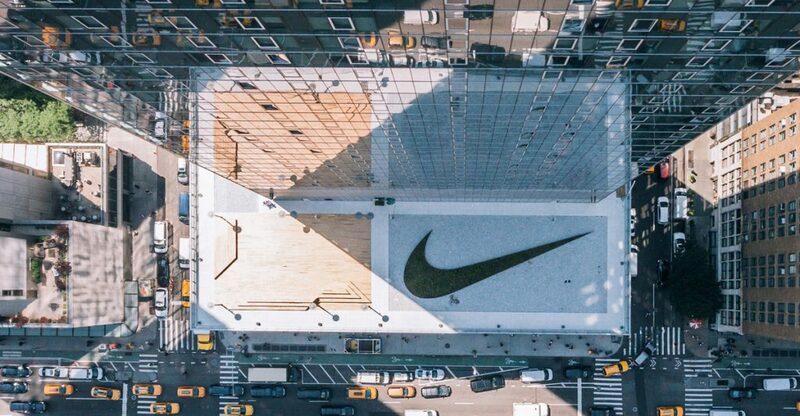 MINI Rooftop is an exclusive event space by MINI for fashion shows, parties, symposiums and even yoga sessions in Manhattans Hell's Kitchen neighborhood. The 4,500-square-foot landscaped expanse, designed by the New York-based architectural firm of HWKN, provides visitors with a wealth of amenities for relaxation and creativity including a lounge area and sun deck. 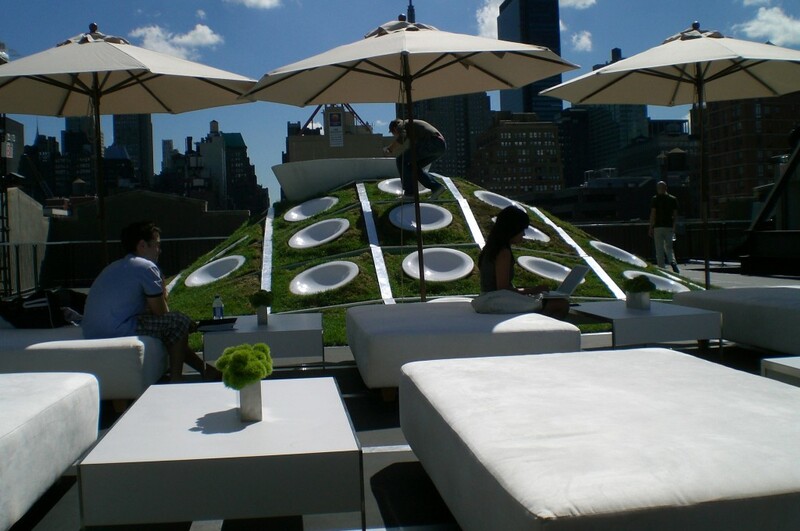 Central to the design is an 8-foot grassy hill implanted with plastic dishes that serve as seats for lounging. 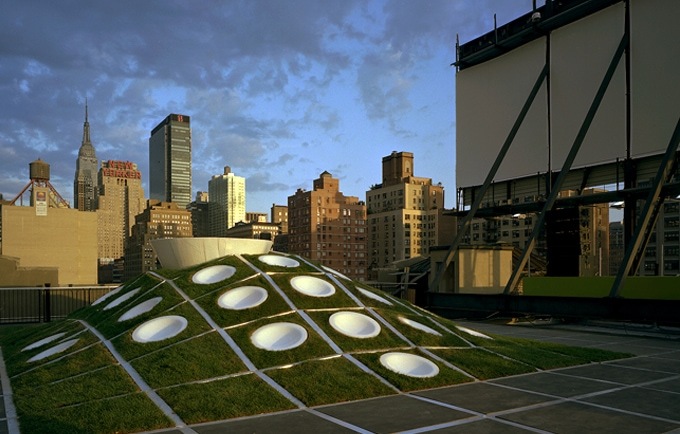 The design is a contrast between the organic element of the grassy hill and the grid pattern that is imposed over the entire space.